Glycolysis is derived from the Greek words (glykys = sweet and lysis = splitting). It is a universal catabolic pathway in the living cells. Glycolysis can be defined as the sequence of reactions for the breakdown of Glucose (6-carbon molecule) to two molecules of pyruvic acid (3-carbon molecule) under aerobic conditions; or lactate under anaerobic conditions along with the production of small amount of energy. This pathway was described by Embden, Meyerhof and Parnas. Hence, it is also called as Embden-Meyerhof pathway (EM pathway). Glycolysis occurs in the cytoplasm of virtually all the cells of the body. There are two types of glycolysis. Aerobic Glycolysis: It occurs when oxygen is plentiful. Final product is pyruvate along with the production of Eight ATP molecules. Anaerobic Glycolysis: It occurs when oxygen is scarce. Final product is lactate along with the production of two ATP molecules. Glycolysis is an extramitochondrial pathway and is carried by a group of eleven enzymes. Glucose is converted to pyruvate in 10 steps by glycolysis. This phase is also called glucose activation phase. In the preparatory phase of glycolysis, two molecules of ATP are invested and the hexose chain is cleaved into two triose phosphates. During this, phosphorylation of glucose and it’s conversion to glyceraldehyde-3-phosphate take place. The steps 1, 2, 3, 4 and 5 together are called as the preparatory phase. This phase is also called energy extraction phase. During this phase, conversion of glyceraldehyde-3-phophate to pyruvate and the coupled formation of ATP take place. Because Glucose is split to yield two molecules of D-Glyceraldehyde-3-phosphate, each step in the payoff phase occurs twice per molecule of glucose. The steps after 5 constitute payoff phase. Glucose is phosphorylated to form glucose-6-phosphate. The reaction is catalysed by the specific enzyme glucokinase in liver cells and by non specific enzyme hexokinase in liver and extrahepatic tissue. The enzyme splits the ATP into ADP, and the Pi is added onto the glucose. Hexokinase is a key glycolytic enzyme. Hexokinase catalyses a regulatory step in glycolysis that is irreversible. Hexokinase, like many other kinases, requires Mg2+ for its activity. Glucose-6-phosphate is isomerised to fructose-6-phosphate by phosphohexose isomerase. This reaction involves an aldose-ketose isomerisastion catalysed by phosphohexose isomerase. There is opening of the glucopyranose ring of glucose-6-phosphate to a linear structure which then changes to the furanose ring structure of fructose-6-phosphate. Fructose-6-phosphate is further phosphorylated to fructose 1,6-bisphosphate. The enzyme is phosphofructokinase-1. It catalyses the transfer of a phosphate group from ATP to fructose-6-phosphate. 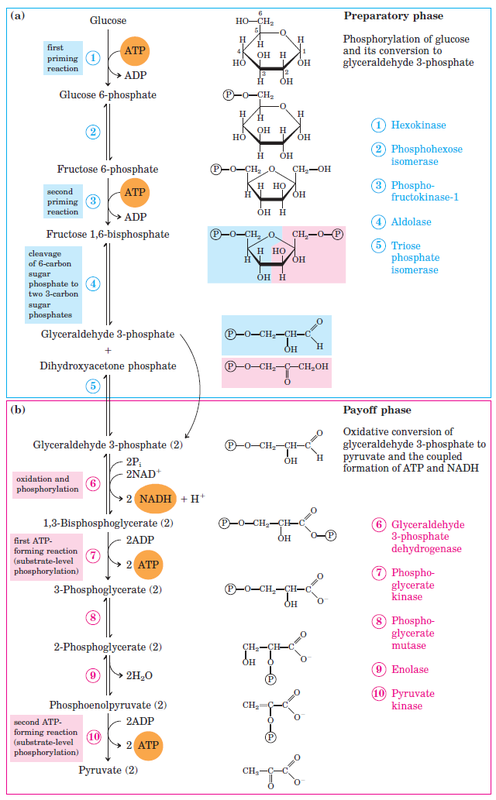 One ATP is utilised for phosphorylation. Phosphofructokinase-1 is the key enzyme in glycolysis which regulates breakdown of glucose. The 6 carbon fructose-1,6-bisphosphate is cleaved into two 3 carbon units; one glyceraldehyde-3-phosphate (GAP) and another molecule of dihydroxy acetone phosphate (DHAP). The enzyme which catalyses the reaction is aldolase. Since the backward reaction is an aldol condensation, the enzyme is called aldolase. is that glucose is now cleaved into 2 molecules of glyceraldehyde-3-phosphate. This reaction is rapid and reversible. The first step in the payoff phase is the oxidation of glyceraldehyde 3-phosphate to 1,3-bisphosphoglycerate. This reaction is catalyzed by glyceraldehyde 3-phosphate dehydrogenase. It is the energy-yielding reaction. Reactions of this type in which an aldehyde group is oxidised to an acid are accompanied by liberation of large amounts of potentially useful energy. During this reaction, NAD+ is reduced to NADH. The enzyme phosphoglycerate kinase transfers the high-energy phosphoryl group from the carboxyl group of 1,3-bisphosphoglycerate to ADP, forming ATP and 3-phosphoglycerate. This is a unique example where ATP can be produced at substrate level without participating in electron transport chain. This type of reaction where ATP is formed at substrate level is called as Substrate level phosphorylation. 3-phospho glycerate is isomerized to 2-phospho glycerate by shifting the phosphate group from 3rd to 2nd carbon atom. The enzyme is phosphogluco mutase. This is a readily reversible reaction. Mg2+ is essential for this reaction. 2-phosphoglycerate is converted to phosphoenol pyruvate by the enzyme enolase. One water molecule is removed. A high energy phosphate bond is produced. The reaction is reversible. Phosphoenol pyruvate (PEP) is dephosphorylated to pyruvate, by pyruvate kinase. First PEP is made into a transient intermediary of enol pyruvate; which is spontaneously isomerized into keto pyruvate, the stable form of pyruvate. One mole of ATP is generated during this reaction. This is again an example of substrate level phosphorylation. The pyruvate kinase is a key glycolytic enzyme. This step is irreversible. When animal tissues cannot be supplied with sufficient oxygen to support aerobic oxidation of the pyruvate and NADH produced in glycolysis, NAD+ is regenerated from NADH by the reduction of pyruvate to lactate. Some tissues and cell types (such as erythrocytes, which have no mitochondria and thus cannot oxidize pyruvate to CO2) produce lactate from glucose even under aerobic conditions. The reduction of pyruvate is catalyzed by lactate dehydrogenase. Glycolysis is the only pathway that is taking place in all the cells of the body. Glycolysis is the only source of energy in erythrocytes. In strenuous exercise, when muscle tissue lacks enough oxygen, anaerobic glycolysis forms the major source of energy for muscles. The glycolytic pathway may be considered as the preliminary step before complete oxidation. The glycolytic pathway provides carbon skeletons for synthesis of non-essential amino acids as well as glycerol part of fat. Most of the reactions of the glycolytic pathway are reversible, which are also used for gluconeogenesis. Thank you your article help me a lot. Thanks for the elaborate explanation on glycolysis. This was super informative! Thank you!! This is a very clear description of glycolysis. It helped us to understand and memorize the steps of glycolysis very easily. Thank you very much.